I recently lowered my 2015 XC 40 mm using the Lust lowering links. I had previously lowered the bike 20mm using Lust links also but found the bike still too tall. I was able to trim a standard sidestand down 3/8 of an inch which worked great for the 20mm lowering, however when I went down the 40mm I decided to try using a sidestand from a 2016 XRX low (Part T2081546). A couple things were different, first the side stand is shaped a little different and second it uses a pin and c-clip rather than a bolt to hold it on. 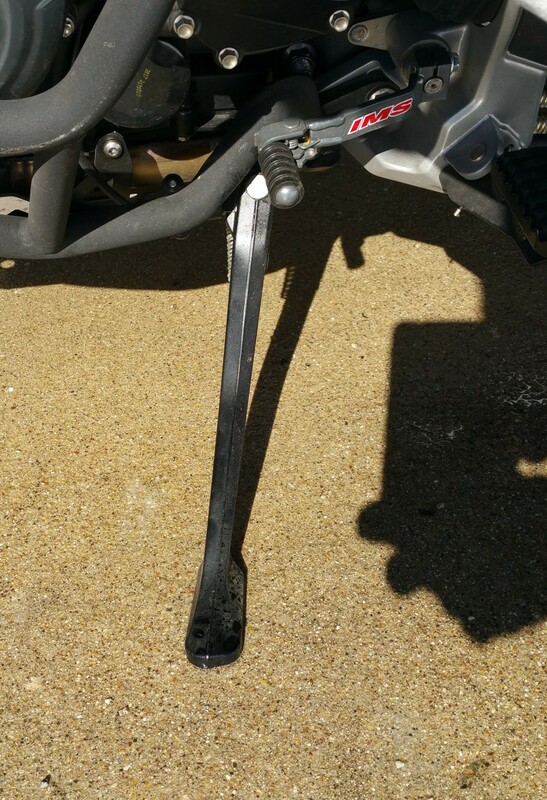 I installed it and it appears to be working fine, the bike leans over OK but, when I mount the bike using the left foot peg, the sidestand appears (and feels) to be flexing. I lowered the bike so as not to have to pick it up again, however, if the stand breaks, I will be right back where I started. Can anyone with a 2016 XCX or XRX low tell me if they experience this same flexing when mounting the bike using the left foot peg? I am approximately 250 pounds dressed, I think you brits may say 18 stone(?). The original stand did not feel as if it was flexing, please I could use some reassurance that this is OK.
Cant say I have noticed any flexing, I weigh 78kg, however I doubt that Triumph would use something that is not rated, it can probably hold way over what one would expect. I’m about the same weight as you when kitted out in my bike gear Zshyster, and have the XRX-Low. I must admit I rarely get on mine by standing on the footpeg with the sidestand down - however I am out later this morning so will let you know. Generally I am able to throw my leg across the seat from the standing position with the sidestand down. The only time normally I might use he footpeg is when mounting using the (lowered) mainstand. So - having tried this (as promised) - there is a slight flexing as you stand on the footrest, but nothing that I'd (personally) worry about, it is only slight. I guess there will always be some movement, even with the full size stand, as the difference in weight from a bike with no rider, to a bike with a rider. As I say, it flexes, but not by a great amount. A couple of times it didn't flex at all so I guess it could be how the stand finally "sits" on the ground when you park it possibly. I was wondering if you could confirm that your sidestand looks like this. This is the one they sent me when I ordered one. (described as a 2016 XRX low) I was a little worried because it did not look like the diagram which showed the standard. If you could confirm if it looks like yours or different and what year yours is.